During the Gold Rush, people were so excited to get to San Francisco start their journey to the Gold Country that often times people would abandon their ships. The leaders of San Francisco, at first, did not know what to do with these ships. Some were left in the harbor, others were ghost ships moving through the water with no crew. Finally, city builders decided to use the ships as filler. The green area on the map used to be ocean. City builders used the ships as land fill to build the city out. Some of the ships were destroyed but some have recently been found underground intact. Read the article to find out how some of the ships can be seen today. 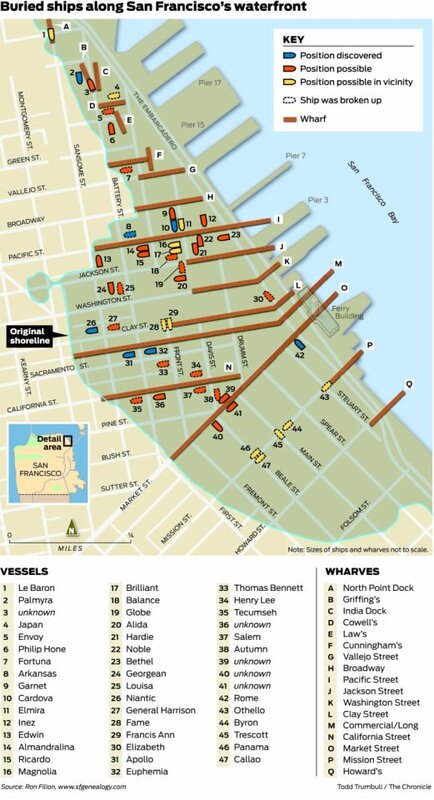 Next time you are in San Francisco see if you can check out a Ghost Ship!